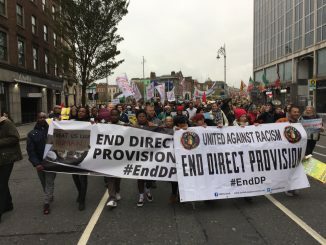 Hundreds of people from across the country, including the North marched in Dublin on Saturday 18 November to protest against the direct provision system. The national demonstration organised by United Against Racism and supported by more than 30 campaign groups, trade unions, NGOs and political parties, including People Before Profit, Solidarity, the Green Party, Irish Refugee Council, Movement of Asylum Seekers in Ireland, European Network Against Racism, Galway Anti-Racism Network, Unite, Ireland Palestine Solidarity Campaign, Rosa and others, was attended by large groups of asylum seekers currently in direct provision centres in Dublin, Galway, Sligo, Cork, Kerry and Limerick. 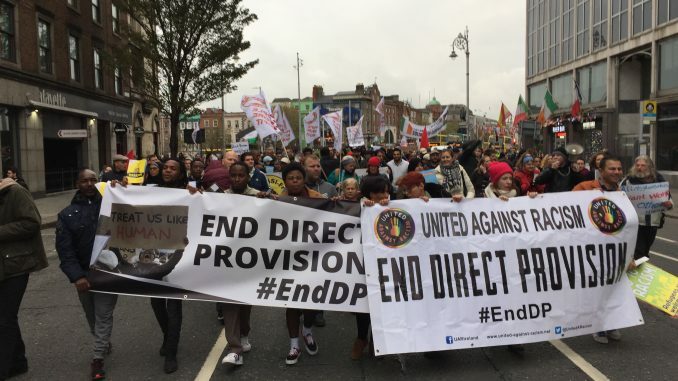 Among the demands of the demonstration were, ending of the direct provision system, right to work, access to third level education and social protection for asylum seekers. Direct Provision System was introduced in 2000 to accommodate asylum seekers while their refugee applications are processed. Currently there are 5000 asylum seekers, including 1600 children in 35, mostly privately operated centres. Direct provision centres are run for profit by more than 15 private operators and over the years companies like Aramark, Fazyard, and Mosney Holiday made millions of Euro profits from government contracts. These operators are compared to US prison business run by private companies. Asylum seekers in direct provision have no right to work, they cannot avail of free third level education and don’t receive any social welfare payments. Instead the government gives €21.60 per week allowance. Direct provision centres are restricted areas with strict access control and management practises. Many asylum seekers speaking at the demo, some more than 7 years in the system, told their stories in direct provision and the serious issues they are facing in segregated, prison like living environment. Many are facing physical and mental health issues and feel trapped in direct provision without an end in sight. Activist pointed out that the recent plans by the government to give asylum seekers a very limited right to work would not help 90% of the people in direct provision due to conditions attached to this proposed change. Speakers also condemned deportations and demand the government to stop the deportations of asylum seekers. 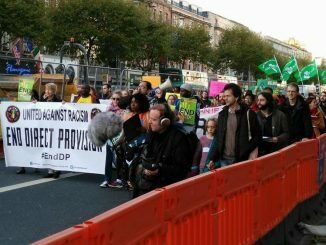 For many years United Against Racism has been actively campaigning against direct provision. Over the past years it has organised many events and demonstrations with more people joining the campaign. 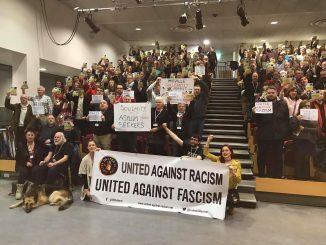 If you like to actively take part in the end direct provision campaign join United Against Racism and be part of a growing campaign.